Besides writing this blog, I also write at Westminster Reads which is an online Bible study/reading site offered by my church, Westminster Presbyterian Church. Last year we read through the New Testament and this year we are reading Torah- the first five books of the Bible. Among other things, Torah tells the early history of Israel from Abraham, and Isaac, to Moses and Joshua. Beginning with Genesis 12 and the call of Abram to Deuteronomy 34 where Moses looks out over the Promised Land just before his death, Torah offers an epic tale of God calling a people and the people’s response. Torah also contains what is often called “The Law”, which Christians can mischaracterize as a set of empty legalistic rules. Mostly Christians are content to ignore Torah thinking that Torah doesn’t apply to Christians. Unless, of course, we can use Torah as “back up” to bolster our argument about a topic or “prove” something in the New Testament. There is a third way, a middle ground between ignoring Torah and selectively mining it for nuggets of ‘truth’. To find that middle ground we need to think about what Torah is and why Torah exists. 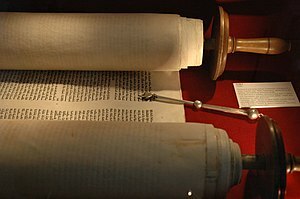 One blog post cannot fully explore all there is to know about Torah. Jewish scholars have been thinking, talking and writing about Torah for centuries. But it is helpful to think about why God gave Israel Torah. In Exodus 19 after God has rescued the people who will become Israel from slavery in Egypt there is a crucial meeting at the foot of Mount Sinai. You’ll notice I referred to the participants as the people who will become Israel. That is because they were not Israel yet.The people, the slaves who left Egypt were a “mixed crowd” (Exodus 12:38). They were not related by ethnicity or religion or family background. What they had in common was a desire not to be slaves any longer. God heard their cry for rescue from oppression and acted through Moses to rescue them. Then God asks them if they are willing to be God’s people. God asks. And the people who will become Israel say yes. Then, God begins explaining what it means to be God’s people.After the people hear the Covenant Code (Exodus 20:22-23:33) they agree again (Exodus 24:7). In Torah we find the “law” in several places across the five books. This figuring out what it means to be God’s people took some time to develop. The Torah we have today developed over many centuries as Israel wrestled with the question, “What does it mean to be God’s people?”. While often Torah is translated as “law” it can also be translated “teaching”. This idea of teaching is important. The people who will become Israel need to learn how to be Israel. Remember they live in a world that assumes the presence of many gods. That was the standard belief. The people who will become Israel are asked to commit to one God, the one true God. The people who will become Israel are asked to live in a way that is completely foreign and novel in their time and place. As we read Torah we discover that that wasn’t easy to do. Israel was always tempted by the false gods of other nations. One of the things Torah does is give the people ways, practices and, yes, rules about how to be God’s people. Torah helps the people who will become Israel become Israel. Torah helps them identify themselves, to become formed into a holy people. Torah gives the signs, the markers, the boundaries. To follow Torah is to proclaim oneself a follower of the one true God of Israel. Obeying Torah is a declaration of who one is, over against the other cultures and nations with their false gods. If you have spent any time reading Torah’s rules and commands you might have noticed the commands do at least, three main things. They tell the people how to live together. Torah sets the standards for community life. Now Torah’s standards, in their particularity, are not our standards. We don’t live in the 4 century BCE or the 1st century CE. Torah’s laws need to be understood in their own time and place. They are particular rules for particular people. That said, Torah’s emphasis on fairness and justice need to be recognized and honored. Torah also has lots of rules about worship. Torah explains to Israel the proper ways for them to approach God. Again these are shaped by time and place. But the idea that God needs to be worshiped and approached reverently and intentionally and communally is important. In Torah there is a great epic tale of the creation of God’s people. Torah tells the story of how God and Israel’s life together grows and develops. Torah with all it’s rules and laws, can help Christians think seriously about what it means to live as a community with God and each other. The specifics of the laws might change but Torah’s holistic focus on how we live as the covenant community of God is instructive. It is important for us to spend some time thinking about the purpose of Torah, so we read Torah in better ways. Not as rule book but as the story of God’s people which can help us in our quest to live as God’s people. And understanding Torah better, helps us understand Jesus better. Have you read Torah? What did you think about it? I’d like to know. Posted in Bible, community, God. Tagged Biblical interpretation, Torah.